The word doula comes from the Greek word meaning, “a woman who serves.” Doulas are experienced labor assistants who provide non-medical, physical, emotional and informed choice support in prenatal care, during labor and birth and during the postpartum period. 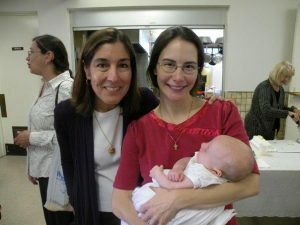 I recommend that you interview at least 3 doulas to help you find the best fit for you. Experience is important, but sometimes a newer doula has the enthusiasm to make up for her lack of experience. 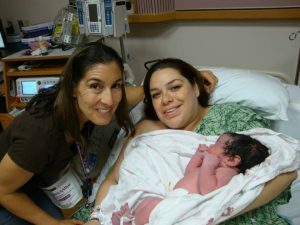 How a doula interacts with the medical staff is important. There is a fine balance between open communication between the doula and the medical staff and not overstepping her boundaries. Your doula should instill in you a feeling of confidence, calm and trust. During our prenatal visits, we will discuss YOUR desires for birth. Every women is different in how she sees her ideal birth playing out. It doesn’t matter what your friend’s birth was like, or your sister’s, or mine for that matter. I want to hear your biggest wishes and desires. I also want to hear your biggest fears about birth and try to build some coping techniques around them. We will also discuss the role of the birth partner and clarify what he or she is comfortable doing. Some partners are comfortable catching their new baby, others would like to stay “north of the equator”, as I like to say. There is no judgement either way, but what’s important to me is that the birth partner is comfortable with their role because this is their experience too. 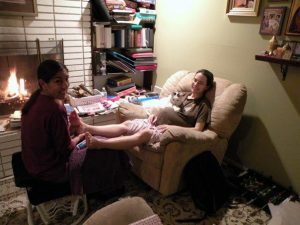 Also included in my service is a prenatal foot pampering session. During the second prenatal visit, I will soak mama-to-be’s feet in a soothing herbal salt bath and give her a relaxing foot massage. I encourage partners to be involved too and help with a hand massage while I focus on her feet. At this time, I also instruct couples on techniques for acupressure during labor. I can tailor the prenatal meetings to your personal preferences too. Some couples want to practice labor positions, others want to focus on relaxation techniques. My goal is to help you find what you need to give birth. Our postpartum meeting will include going over your birth experience, answering new parent questions, help with breastfeeding, and a new mom belly bandage wrap.